Under golden spires and Thai architectural prowess comes the clangs of fired up woks, the smell of stir-fried garlic and spices, and the merging of generations -- old and young -- joining together for a traditional Thai meal. Standing here, you might believe that you’re in Thailand, but beyond the temple, known as a wat, stands a strip mall, a Shell gas station, and a street sign that reads “Coldwater Canyon Avenue.” Believe it or not, you’re in North Hollywood. My mom has always told me that no matter where I am in the world, if I’m seeking Thai community and food, the first thing I have to do is find a wat. That’s exactly what she did when we first immigrated to America 24 years ago, where she stumbled upon Wat Thai of Los Angeles -- a Buddhist temple nestled in the San Fernando Valley, just 15 miles north of Downtown LA. It also happens to be the first -- and largest -- Thai temple in the country. The wat serves as a home and place of meditation for practicing Buddhist monks, as well as a weekend Thai school with language, music, and traditional dance lessons. It’s a place of coalition building, where aunties and uncles come together to gossip, exchange recipes, and speak their native tongues. It’s where I spent the majority of my weekends growing up: begrudgingly trying to meditate (and failing), learning the Thai alphabet, practicing traditional dance, and -- of course -- dining on arguably some of the best Thai food in America. Something I’ve learned in my 24 years as a Thai-Brit living in America is that where there is a collective of Thai people, there will be a wat. And where there is a wat, there will be traditional Thai food. Thai people love to eat; food is an expression of our love, family, and kinship. Thai people love to eat; food is an expression of our love, family, and kinship. This enthusiasm about our cuisine results in one of the biggest draws that Wat Thai of Los Angeles has: a weekend outdoor food court, which serves up steaming plates of Thai curries, refreshing drinks, and an assortment of coconut-based desserts. It has even been described as having "some of the best Thai food outside of Bangkok." As the Thai population in America grew, from the initial wave in the ‘60s and onwards, Thai temples began to erupt throughout the United States. Wats are sprinkled across the country -- and the world -- as places for Thais to gather and find community, food, and a slice of familiarity, despite living thousands of miles away from Thailand. And Wat Thai of Los Angeles -- which opened in 1971 -- isn’t the only place where you can find an incredible Thai meal. 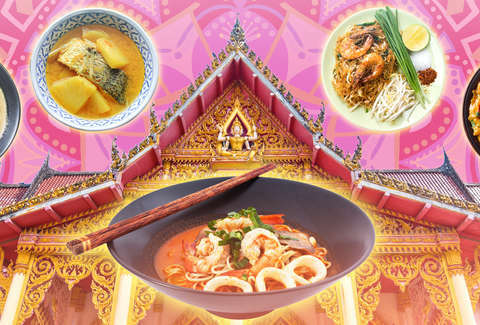 From Minneapolis, to Dallas, to Tampa, temples are opening up their doors and offering opportunities for food enthusiasts to experience a taste of Thailand, all the while supporting their local wat. With different volunteers come different approaches to Thai treats; some may prepare their interpretation of sai oua, a Northern Thai sausage. Others may toss together a Southern delicacy: crab stir fried in curry. Some are homecooks excited to share a new dish, some are families making their weekend bread-and-butter at the Thai market, and some are blossoming Thai businesses continuing a legacy of homemade Thai food. The reason for the rotation in menu is what makes Thai wats so special: everything is run by volunteers enthusiastic about community building and providing their most beloved dishes. The volunteers are as diverse as they are passionate about Thai cooking -- and it shows. You’re getting high-quality, home cooking for a fraction of a trendy Thai spot. A bonus of dining out at a Thai temple parking lot is the price of the food. Though you’re getting high-quality, home cooking, the prices of the food are a fraction of what you’d get at your latest trendy Thai spot, with most dishes ranging from $3-$8. With such low prices, it’s possible (and easy) to feed yourself a 3-course meal, beverage in hand, for under $20. If you do want to eat at a wat, just make sure to bring some cash with you. Whether you’re handing over your crumpled bills to the vendors directly, or exchanging them for plastic tokens in a dining hall system that many wats utilize, it's cash-only. KQED noted that the reason wats may rely on their cash-only mantra is due in part to the fact that these spaces are non-profits, and therefore taking full advantage of patrons’ cash donations to maintain the temple. Though somewhat tedious, the cash that diners provide help support the monks, upkeep of the temple grounds and schools, and continue supporting the Thai food courts that more and more people are venturing to find. When heading to your local temple for a meal, it's worth remembering to be respectful, as wats are places of worship and oftentimes double as schools. This means adhering to a more modest dress code, taking off your shoes when entering the temple, never pointing your feet towards statues of Buddha or altars of worship, and generally behaving quietly and graciously. 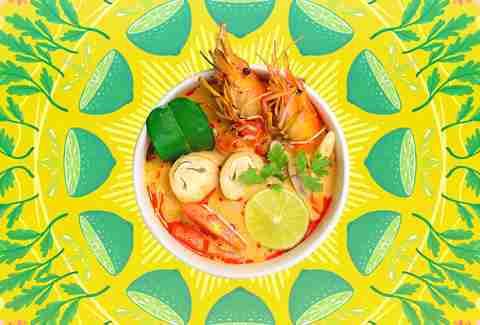 It’s an exciting time to be a fan of Thai food. As more people travel to Thailand and return home longing for a slice of their vacation, more wats are opening their doors and happily providing an immersive and welcoming experience. Thai people are extremely skilled at improvisation and it reflects in the amount of suburban lots in America that have been transformed into places of worship and makeshift cafeterias. Using portable gas stoves and huge woks, Thai aunties invite you to make your way to the wat, say a prayer, and fill your stomach. Kat Thompson is a staff food writer at Thrillist who’s been visiting Thai temples on the weekends since childhood. She can confirm that temple food is just as good as the stuff you’ll get in Thailand. Tweet her your favorite Thai dish @katthompsonn.